Car chargers, though an essential part of every car driver’s life, don’t get enough coverage. Yet they play an important part for the kind of people who have to spend more than an hour in the car during the course of the day, as they help us keep our phones and tablets running while we are in the middle of nowhere. The main reason why they don’t get much press is simple. They are plain boring devices, which work well enough to get you out of a pickle, but hardly impress. 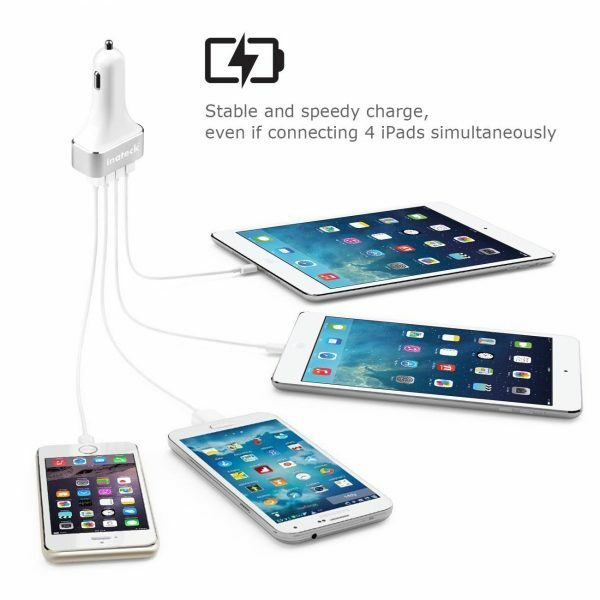 The Inateck Premium 9.6A / 48W Charger is set to buck the trend by giving you a reliable and impressive product that does it all. It features 4 USB ports, each giving you up to 2.4A, meaning you can charge 4 tablets at the same time, and at a power which doesn’t get in the way of productivity. Kids in the back want to watch movies on a dead iPad? This has got them covered! 4 kids in the back of a bigger car all want to do the same? This has got them covered too! More so, it features an intelligent chip inside (no idea on what or how, etc, doesn’t say in the specs) which sees what device is plugged in and charges it accordingly. 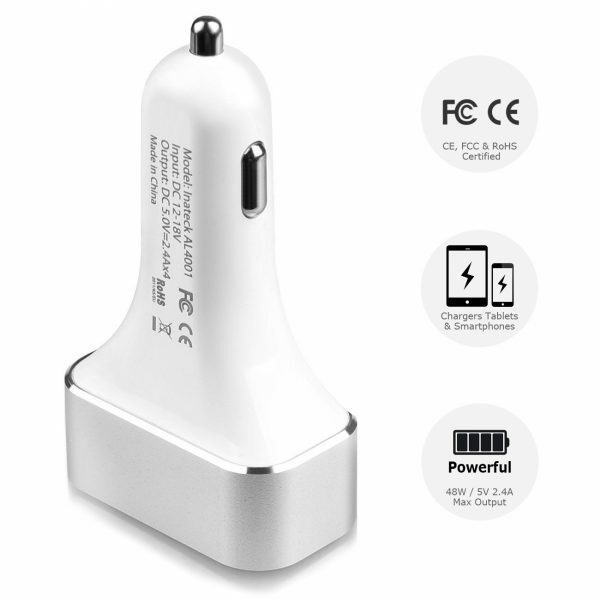 For example, the LG G4 often complains with unofficial chargers, asking to use the smart charger for speedy charging. This one has it covered. Other features include heat protection, fire proof material, over current and short circuit protection, all of which are useful to keep your car and devices well protected. The packaging is pretty neat too, as it is all fitted in a plastic and aluminium casing which is compact and looks good in the car. It also features an LED which not only lets you know when it is powered on, but also helps you find it in the dark. It retails for £15.99 (down from £32.99). It is hard to talk about chargers, or car chargers for that matter, but this has impressed me more than anything I have ever tried so far. As our devices get hungrier, and their numbers grow, we all need one of these in our cars.